July 22, 2010 - In commemoration of San Marino's Medieval, the San Marino Consulate office held a wine-tasting event featuring five different wines from San Marino. 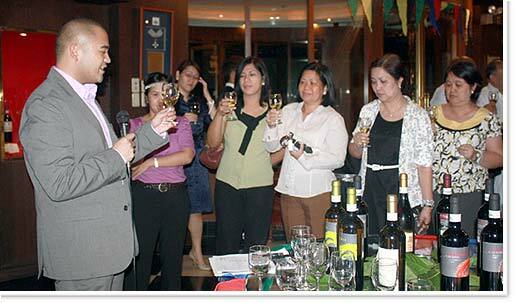 Mr. Miguel David, a professor of beverage management at Enderun Colleges, tackled food and wine pairing. Guests sampled two white wines - the Sangiovese, the Brugneto, and the Moscato dessert wine. San Marino's Medieval Festival is the most anticipated summer festival in the oldest recorded sovereign state and constitutional republic in the world. the festival is traditionally celebrated with fine wine on the latter part of July. San Marino is a landlocked enclave within Italy, founded in September 3, 301 by stonecutter Marinus of Rab. The country is famous for its postage stamps, wines and cheeses.